When the owners of this swimming pool invited us back to add on to the pool we had previously built, we were thrilled to help them achieve a new goal: Connect the newly acquired property behind the pool to the existing property in front of it. In essence, we needed to take a sentence-ending period (the pool) and convert it into the comma between two statements. And the solution presented itself with the implementation of a beautiful, 12 foot diameter, formed-concrete fountain bowl. It embraced and enhanced the existing elegance of this environment and provided a sort of "center point" that celebrated the merging of the two areas. 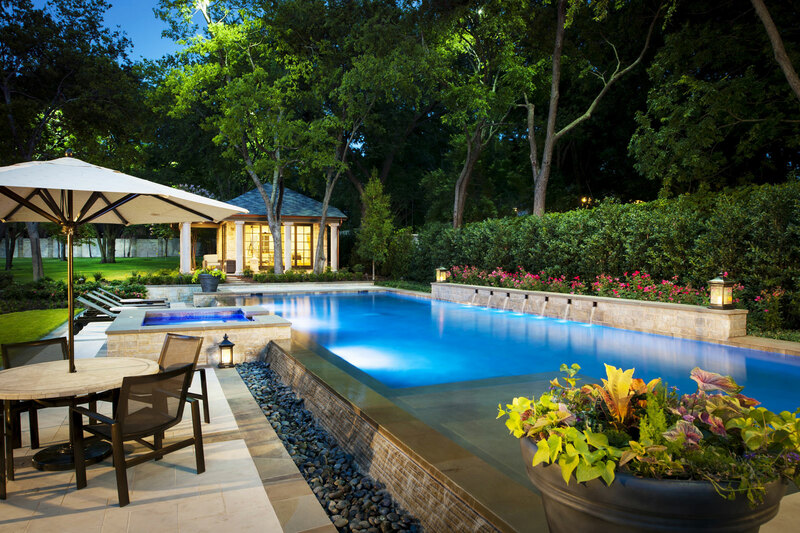 When the owners of this swimming pool invited us back to add on to the pool we had previously built, we were thrilled to help them achieve a new goal: Connect the newly acquired property behind the pool to the existing property in front of it. In essence, we needed to take a sentence-ending period (the pool) and convert it into the comma between two statements. And the solution presented itself with the implementation of a beautiful, 12'-0" diameter, formed-concrete fountain bowl. It embraced and enhanced the existing elegance of this environment and provided a sort of "center point" that celebrated the merging of the two areas.